Abstract: In demand paging virtual memory systems, the page fault rate of a process varies with the number of memory frames allocated to the process. When an increase in the number of allocated frames leads to an increase in the number of page faults, Belady's anomaly is said to occur. 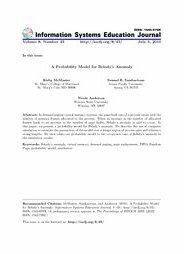 In this paper, we present a probability model for Belady’s anomaly. We describe the use of computer simulation to estimate the parameters of the model over a design region of process sizes and reference string lengths. We then relate our probability model to the occurrence rate of Belady’s anomaly in the simulation results.